You can query what you want and save requests! You’re dealing with a strongly-typed schema! It offers a rich, evolving ecosystem for you to enjoy! "Map your database schema 1-to-1 to your types." On our side, however, it’s not as easy as that since our content infrastructure lets the users define the structure of their content freely. This means we could be serving a particular user a very flat data entry structure while delivering complete content trees reaching several levels deep to another user. This flexibility means we deal with data structures of all kinds, making support for GraphQL trickier since we now have to create GraphQL schemas on the fly and deal with domain objects based on abstract syntax trees instead of simply mapping a database schema to GraphQL. If this sounds complicated, don't worry – this article will cover everything in detail. Author’s Note: This article is based on a meetup talk I gave; a recording of the talk is linked at the end of this article. The foundation of any GraphQL API is a so-called abstract syntax tree which is heavily used server side to deal with schema definitions and parsing of the actual GraphQL query. But what is an abstract syntax tree? For me, the word abstract syntax tree (AST) is just a fancy way of describing deeply nested objects that hold all the information about about some source code—or in our case, GraphQL queries. What’s included in the abstract syntax tree? The AST includes a lot of metadata, such as location in the source, or identifiers, such as argument names; and thanks to this deeply-nested JSON object, we now have all the power we need to work with GraphQL schemas and queries. All that meta information comes in handy when developing your own GraphQL server; for instance, from that, we can tell you the line of your query that’s causing problems easily. For the schema, these POJOs (Plain Old JSON Objects) are usually translated into so-called domain objects. They encapsulate the information contained in the AST, but are enriched with methods and are proper instances of the GraphQL base types. For example, every type that has fields to select from will be created as a GraphQLObjectType instance. Now you can define a function on it how data should be fetched. Of course it has to be a little different at Contentful, given that we don’t have a System Definition Language (SDL) at hand that we can parse. So what we do is simply creating those domain objects "by hand", based on the content model we obtain from the database. "What about the line numbers for my errors? 😱" I hear you asking. Luckily, we only need to do that for the schema generation - we can fully leverage the usual GraphQL flow for query documents that you send us, from the string you send us down all the way to the response JSON. 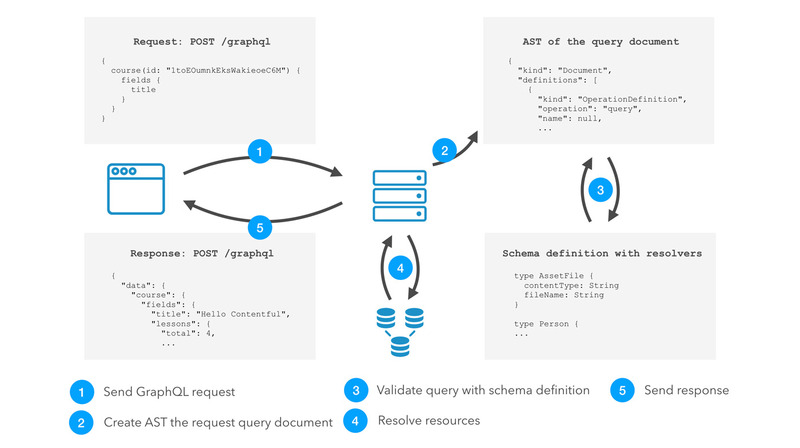 Server implementation of the GraphQL API endpoint has to provide a schema in a so-called type system definition language which defines what data is available at this endpoint. On the client-side, a developer can then make requests that include a query document defining what data should be contained in the response. The definition above defines that the type AssetFile has exactly two fields (contentType and fileName), with both being type String. The cool thing about that definition is now that we can use it inside of other type definitions. What’s included in an entry? How does entries relate to each other? What can be accessed and where? When you use tools like GraphiQL, an in-browser IDE to explore GraphQL endpoints, you may have noticed that you can easily discover the data available at the API endpoint by opening the docs section. The docs section includes all information based on the schema that was written in the SDL you defined. The way these GraphQL tools work is that they send one initial request on startup – a so-called IntrospectionQuery, which is a standard GraphQL request that uses POST and includes a GraphQL query in the request payload. The requests performed by a GraphQL user can differ based on the use of different query types. The response to this introspection query provides all the schema information that is needed to provide API documentation, make auto-completion possible, and give the client-side developer all the guidance to happily query whatever data she is interested in. Now that we have defined the available data schema, what’s missing is the GraphQL request that includes a query document. The query document is the actual GraphQL query that you already saw at the beginning of this article. The query document is basically a string value that’s included in the payload hitting our GraphQL endpoint. 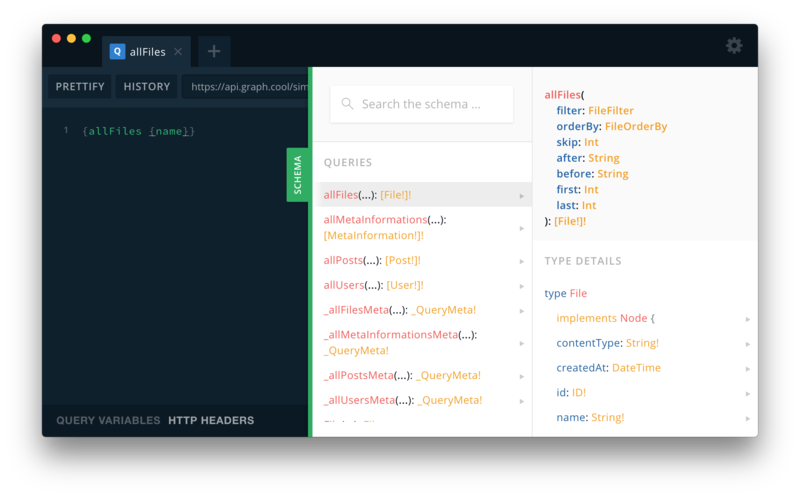 The tools GraphiQL and GraphQL Playground will help in writing your first queries easily. So why are ASTs so important for GraphQL? When a request hits our GraphQL endpoint, the schema written in SDL and the query document included in the request payload will be read and transformed into ASTs. If parsing succeeds, we can be sure that both the query and schema are valid; otherwise, we can display errors detailing where something is syntactically incorrect. Then we visit each field name in the query document to check if a corresponding type definition is present in the schema and if they’re compatible—do they have the same amount of arguments and are these of the same types? If these validations pass, we can proceed to respond to the request by resolving the resources requested in the query. Resolvers are a topic we won’t cover in this article but in case you’re interested, you can read Prisma’s introduction "GraphQL Server Basics: GraphQL Schemas, TypeDefs & Resolvers Explained"—it’s an excellent read! GraphQL’s power lies in its schema and type definitions which move API development to a completely new level. Thanks to the rich ecosystem, the tools and the concept of abstract syntax trees, it’s good fun to develop our new GraphQL endpoint at Contentful. Moreover, it’s not only about developer experience but rather about a whole set of new possibilities. With ASTs, you can easily transform the resulting schema definition—this is, for example, what makes schema stitching easily possible. Schema stitching is the idea that you can take two or more GraphQL schemas, and merge them into a single endpoint that can pull data from all of them. Learn more about getting started with GraphQL and Contentful. Start by creating a free Contentful account, if you don't already have one, and find out how effortless our content infrastructure works with your code and static site projects. Sidenote: Nikolas Burg also gave an excellent presentation on how to do schema stitching using Contentful and Prisma at our previous Contentful meetup in Berlin. It’s worth watching!